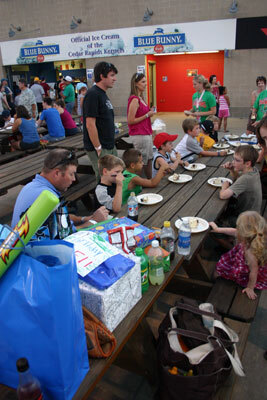 Celebrate Your Child's Birthday with the Kernels! Baseball and birthdays go hand in hand, and the Kernels offer a birthday party to remember with Mr. Shucks, the birthday person and nine guests! The party is held on the spacious concourse on the third base side, just behind the lawn seating. The Kids Birthday Package includes 10 Club tickets for everyone in the group, 10 meal vouchers for dinner at the stadium (includes a hot dog, chips, and a 20 oz. bottled soda or water), 10 souvenir pennants, a birthday cake and special cake presentation on the LED board during the game, and the opportunity for the birthday boy or girl to throw out the first pitch. The total cost of the package is $185 and additional tickets are just $17 each. Birthday parties must be booked at least two weeks in advance of your desired date, and are limited for each game so we encourage you to schedule your party early! For more information or to book your party, contact Andrea Brommelkamp at 896-7603 or by e-mail at andrea@kernels.com. Please note, this is NOT to request a PA message or photo on the Kernels LED board during a game. For more information on announcements, please contact Andrew Pantini at 896-7601 or by e-mail at andy@kernels.com.